Keeping up with your favorite band or singer can be tough. Real tough. There are so many online music platforms right now, and most artists feel that they need to be active on all of them to gain the largest fanbase and exposure on the Web. As a fan, it’s difficult to know where to look. As an artist, updating them all can fee like a full-time job in itself. 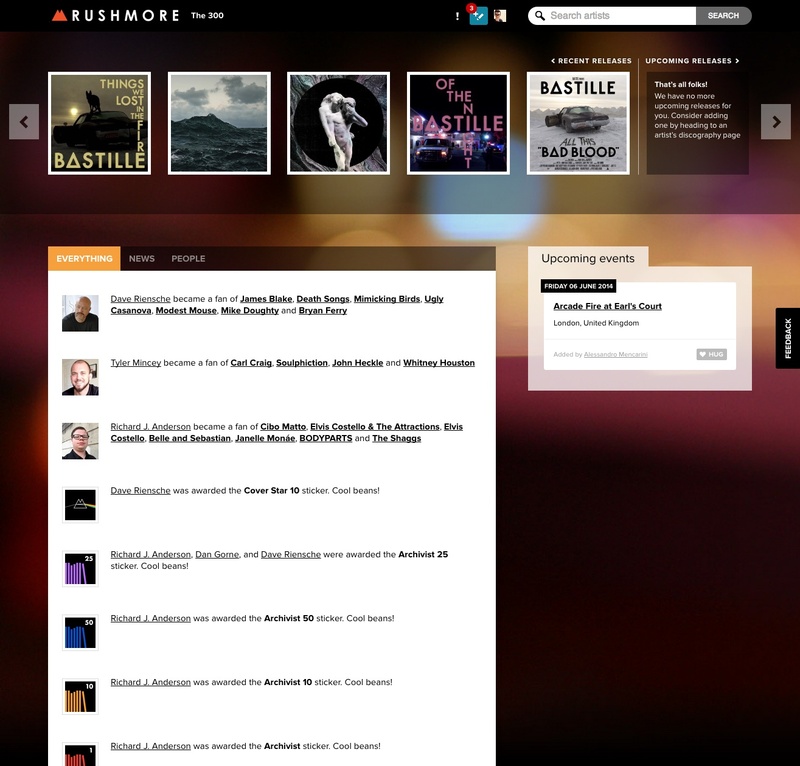 Rushmore.fm is the latest to enter the fray, promising a simpler means of bringing fans and artists closer together. Therein lies the irony though. To simplify the system, fans and artists now have yet another music service to consider. The hope, as always, is that a new entrant will nullify the competition if it gains enough traction, rather than make the problem worse. Rushmore.fm has been in beta for a while, but yesterday it finally opened its doors to the public. Let’s dive right in. 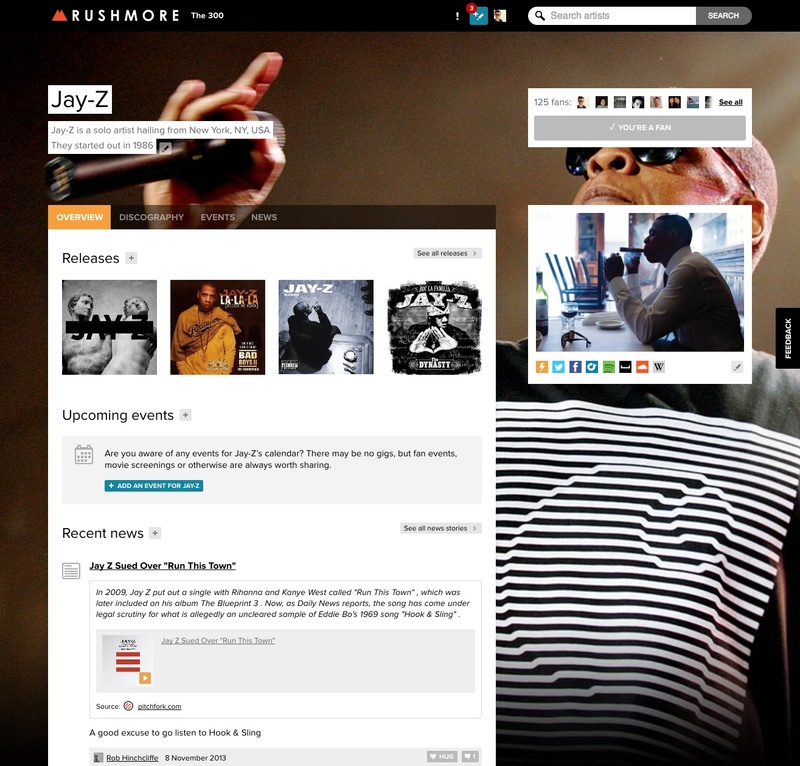 Rushmore.fm is a self-contained social network, bolstered by useful information about upcoming concerts and recent releases. As a fan, you can join with either a Facebook or Twitter account after listing five of your favorite artists. 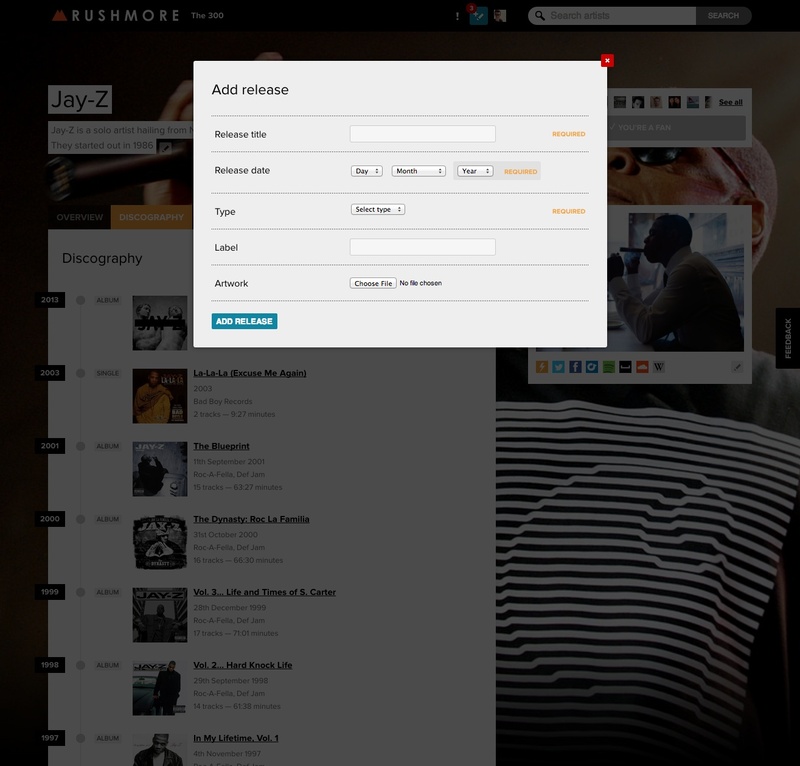 Rushmore.fm will ask that you pick a username, password and avatar – the usual registration process – before inviting you into its music-focused community. Along the top of the page is a carousel showcasing the latest albums released by your chosen artists. Rolling your cursor over the album artwork reveals the band or singer, as well as the name of the record and the date it was released. You can jump to the album page for a full breakdown of the track listing and give it a Hug – Rushmore.fm’s take on a Facebook Like. The majority of the homepage is taken up by a feed split into three categories: Everything, News and People. Everything will show all of the activity and content posted both by artists and other fans that you follow. These often feature announcements, release updates and tour news, which you then can read from the original source, comment on, or Hug. They’re not quite tweets, but Rushmore.fm has clearly tried to make each post as compact as possible so that you can quickly skim through them. News and People filter your stream based on their relevant content type, and there’s also a calendar on the left-hand side of the page for a simple heads-up on when your favorite artists will next be playing. A search bar at the top of the page lets you look up new artists – each one has a profile page where you can identify yourself as a fan, review their discography, event schedule and news stories. On the right-hand side there’s also a relevant profile picture with shortcuts to other connected accounts, such as Twitter, Facebook, SoundCloud, Rdio or Spotify. 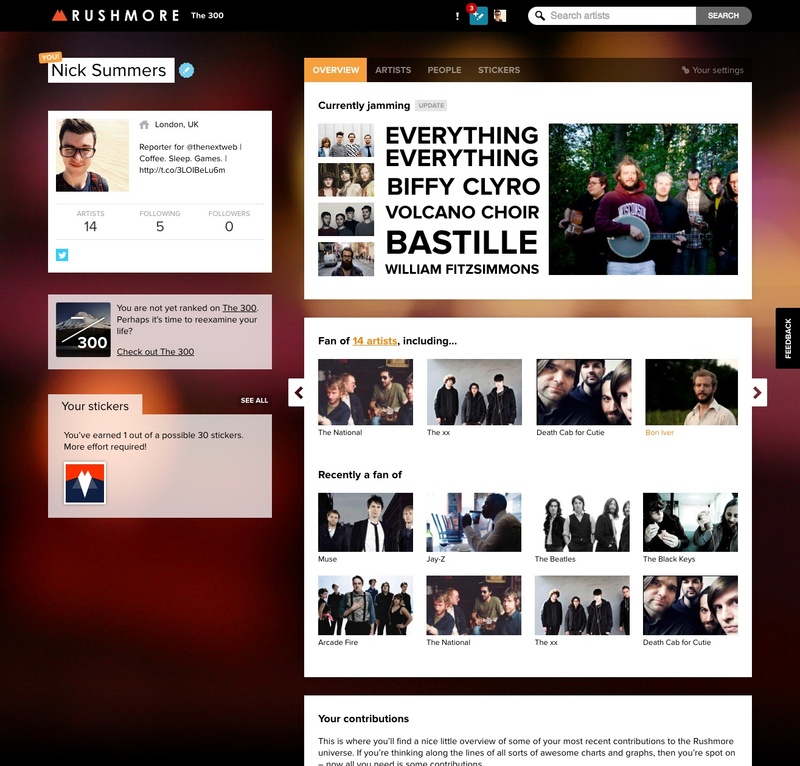 You might be wondering how Rushmore.fm is going to attract new artists, but truthfully it might not need to. Members can be updated to Editors – initially, each Editor can upgrade three fan accounts – and then update the information on the site. Essentially, the platform is Wikipedia for music. Rushmore.fm is littered with contribution icons, which allows you to add news stories, an upcoming events, albums in their discography and more. It’s a novel idea. Rushmore.fm awards stickers based on your contribution, and there’s a leaderboard called The 300 which updates every week based on your contributions to the platform. So even if you’re not following one of your favorite artists too closely, the idea is that someone else in the community will pick up the slack. Whether it’s the latest news story or a leaked single – if a fan is passionate enough, it’ll probably end up in your feed on Rushmore.fm. 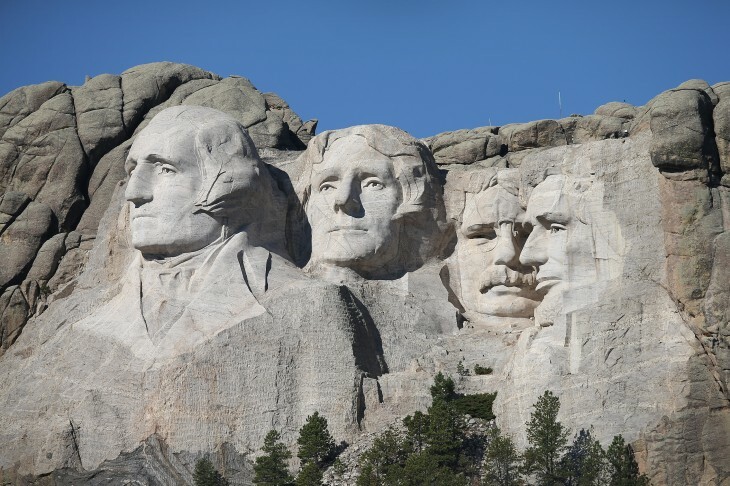 As always, a service like Rushmore.fm will thrive or die based on its user base. It’s a gorgeous, simple platform, which should appeal to music fans who have grown tired of trawling numerous blogs, social networks and streaming services. Without that engagement from the community though, the platform will stagnate . 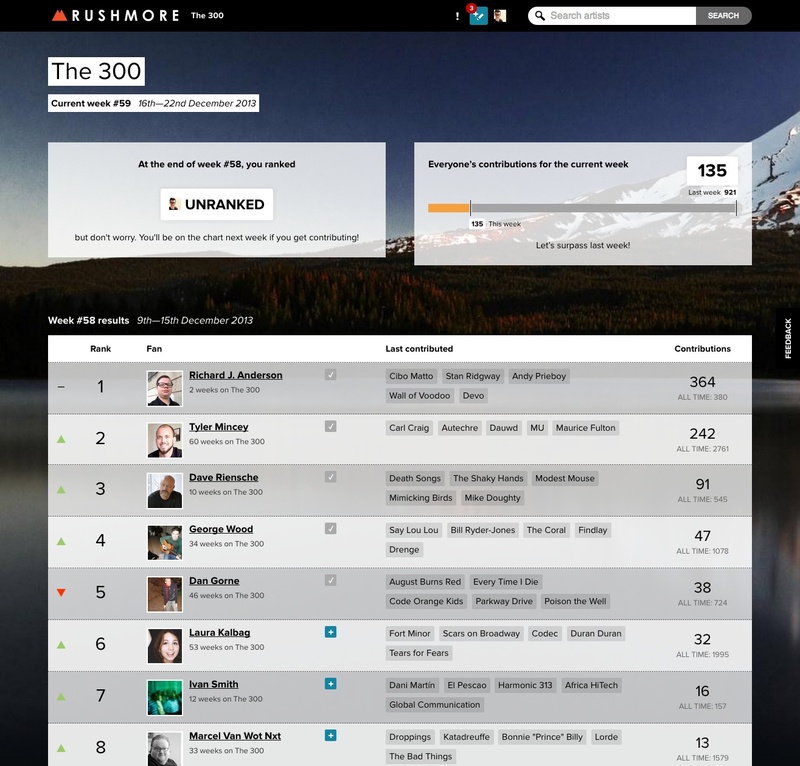 Rushmore.fm took some data from a third-party API early on, but since then all of the information – over 250,000 contributions – have been submitted by its users. Unless the platform starts pulling in data automatically from other sources, it’ll be up to fans and artists alone to ensure it’s shared on Rushmore.fm.